Today is a pain day. Every once in awhile, they creep up. The pain is severe and uncontrollable and obviously, unwelcome. I have had people ask me why God doesn’t heal me. I’ve had people ask me if I have even asked for healing. I have had people ask me if I believe He can do it. Yes, I do believe He can. But right now, I do believe He won’t. I don’t believe He doesn’t heal people – I know He does. I have seen it happen before with my own eyes. I just believe it is not the time for me to be healed. Sometimes, healing doesn’t happen. But I believe healing doesn’t happen because God has a different plan for you. 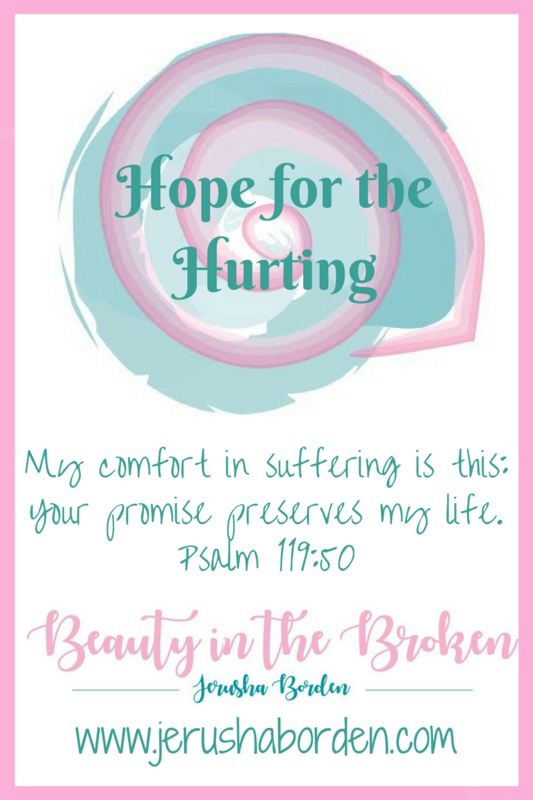 When it is just you and pain, you join with Christ for relief. Even if there is no healing. Sometimes, He allows the pain to exist in your life because He wants you to become closer to Him. In my own personal experience, when the pain is at its worst, that is when I see Him the most. That is when I feel His presence in my life. Through the pain. When life is good, and pain is less and things are going well, it is not as easy to experience His presence. But when you experience pain, He is right there. You just have to trust and obey when you are suffering. Do what He requires of you. I don’t need to know all the reasons why this has happened in my life. I just know it has. At the end of my life, when I see Jesus, all will be made clear. For now, I just need to believe in His plan and obey it. I believe the answer is hope. Hope is more than a feeling. It is a powerful entity that embodies a feeling of trust. I hope – I trust – in a time where my body will be perfect. I hope and believe I will be pain free, with perfect legs. When healing doesn’t happen here on earth, it does happen in death. I don’t mind waiting until death – because for me, death is a new life. And while I am waiting? Deuteronomy 31:6 says, do not be afraid or discouraged, for the Lord will personally go ahead of you. He will be with you, He will neither fail you nor abandon you.” No matter what happens in life, when the pain or the deformation gets worse. No matter what happens. Even when the healing doesn’t come, but the wheelchair does. The moment the inevitable happens and my legs no longer work, He will be there. Because He goes before me into each new day. He goes before me into each new experience, whether it be filled with joy or filled with pain. Yes, today is a pain day. But today, I am rejoicing. I can feel Him here. I can feel Him when legs hurt so much I can’t even get out of bed. I can feel Him when my heart is breaking because my children are suffering. I can feel Him when there is pain. And I know He has a plan for me. I might not understand, but I will be faithful. This is powerful. I have struggled with some chronic physical issues for nearly a year now, and it is difficult sometimes. Sorry to hear you are going through this. It really is difficult sometimes. I hope you were encouraged here today. God is using you. I have to believe God is using me in my illness and pain. God does that. He’s amazing in how he can use the broken. I remember the tale about the woman carrying a bucket of water with a hole in it. She complained to God, but carried the bucket as he commanded. She never got to her destination with the water, but the flowers grew along the path. She planted hope and grew faithfulness. You are doing that. Teaching hope is a much needed lesson! Thank! Thank you so much for your kind words. I had not heard the tale about the woman and her bucket, but that is so beautiful and really embodies the entire message of what Christ can do. Awesome! Thanks for sharing! You are braver than me, although I know you’d rather not endure this; you’d probably say that you’re brave because you have to be. But pain is what I fear the most, and what I skirt around in my prayers. Life scares me so much sometimes, and I don’t even have a bad life! Your story blesses me because it shows God putting his actions where His words are when He says that He will be with me, so I don’t need to fear. God bless you as you keep your eyes on Him instead of your pain. I don’t really feel brave! I feel sad sometimes and wish I didn’t have to go through all of this. But God never promised me a good life full of comfort – and I’m thankful for the path He has me on. Glad you feel blessed by this post!